Can You Track The Sun's Energy? Students will be able to track energy that circulates through earthâs systems. 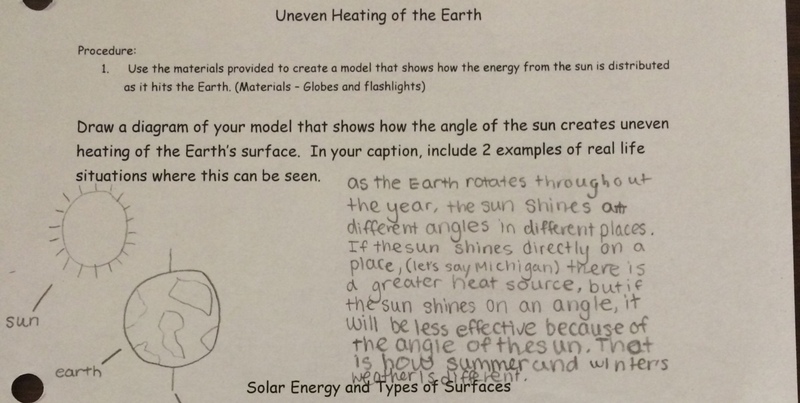 Students use models to track the Sun's energy can take as it leaves the sun and travels through Earth's systems. Students explore with different types of surfaces, globes, flashlights, and an interactive model of the Greenhouse Effect! As this is the first lesson of the unit, I begin with introducing the Essential Question for the unit and breaking down the vocabulary in the question. 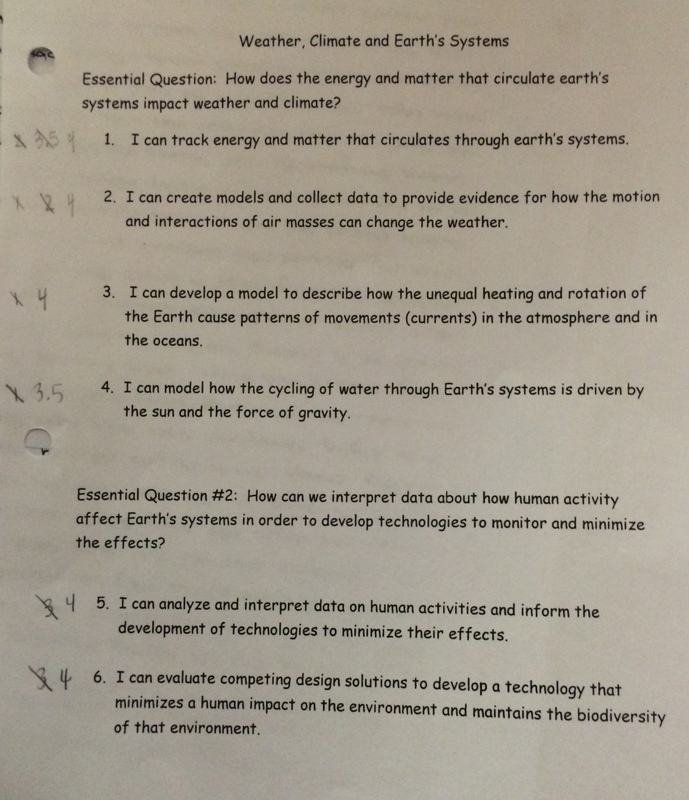 I ask the students to turn to their Literacy Unit Plan and read the Essential Question, "How does the energy and matter that circulate earth’s systems impact weather and climate?" First, ask students to explain what they think of when they read "energy and matter". My students have completed a unit on energy and one on matter and thus have lots of ideas they can share. Some things students share are, "There are lots of types of energy", "Energy and matter are conserved. ", "Energy transfers", and "Matter makes up everything." Next, we talk about what "circulate" means. Students often say things like "moves" or "cycles". I then stop and paraphrase what we have broken down thus far by saying, "Ok, so we are trying to see how these different types of energy that can transfer and the matter that makes up everything moves or cycles." I then ask what they think it means by "earth's systems". Students often start by saying "a system is something that has parts that work together". Sometimes, I have to follow up with a prompting question, "What are the things on Earth that work together to make up the entire planet?". Students often say things like "water", "land", "air", and "us". I make sure students can attach these words to the hydrosphere, geosphere, atmosphere, and biosphere. I then say, "The next key words I see are weather and climate. I'm confused....aren't weather and climate the same thing? Why would both of those words be there?" Students then correct my by explaining that weather is what is occurring right now while climate are the weather patterns that happen year after year. After students offer this definition, I can clarify or verbalize any vocabulary or description in the definition that the student inaccurately shared. Last, I ask the students which of the systems we brainstormed might we be able to track energy and matter through that is related to weather and climate. Students often offer the atmosphere and hydrosphere. Then, I have students rank themselves on each of the skills included in the unit plan. Students rank themselves on a scale of 1 to 4 (4 being mastery). Students will continue to update these scores over the course of the unit. I emphasize to them that it is ok not to be at a "4". Learning is about growth! We will use this starting point to track the growth in their learning. I emphasize that today's focus is Skill 1, "I can track energy and matter that circulates through earth’s systems" and that it is rooted in the Crosscutting Concept "Energy and Matter". I have students read the first section of the notes page as a table and try to make as many connections as they can to the CCC Energy and Matter that they can. I emphasize that they should try to find connections to each of the "bullet points" included in their NGSS Crosscutting Concepts Document. Then, provide each table with time to share with each other the connections they made. As a whole class, call on table groups to share the connections they made to each of the "bullet points" for Energy and Matter. Then, emphasize the key idea that the sun produces a tremendous amount of different kinds of energy and that the transfer of that energy drives earth's systems. Moreover, this energy is conserved! The energy created in the sun is merely transferred and distributed in many ways throughout earth. **This lesson is key for students to connect to the Essential Question. Moreover, it can prime students' brains for what this unit will hold for them. Getting them in the mindset of the focus of the unit will improve their understanding! Without beginning this unit with the idea that energy drives the cycling and motion of matter on earth, students can miss the big picture. In the past, I have taught about weather elements and students leave the unit knowing about air pressure, temperature, winds, etc., but they miss the big picture of how the energy and matter cycling through the earth really drives these processes. Set the tone from the beginning of your weather unit so that students continue to connect back to the big idea! 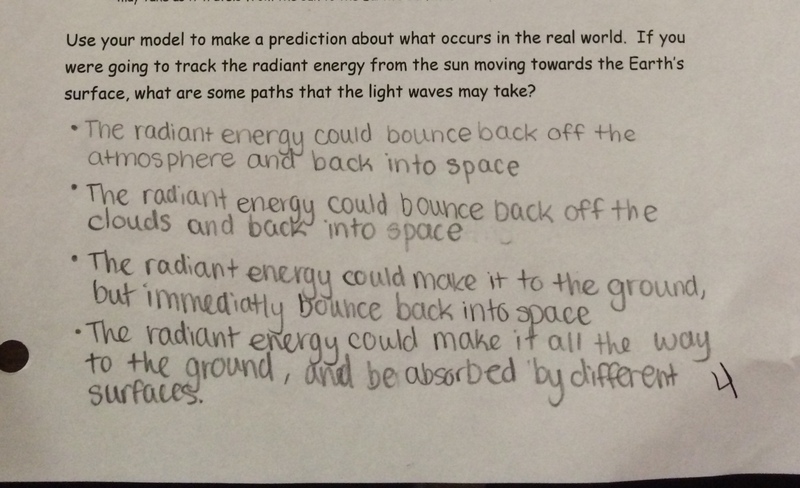 Explain that scientists use models to describe and make predictions about real world phenomena and that they are going to create models to demonstrate their understanding of the rest of the notes page. I created a "model" that can be used to represent how light can take different paths as it travels to the earth. 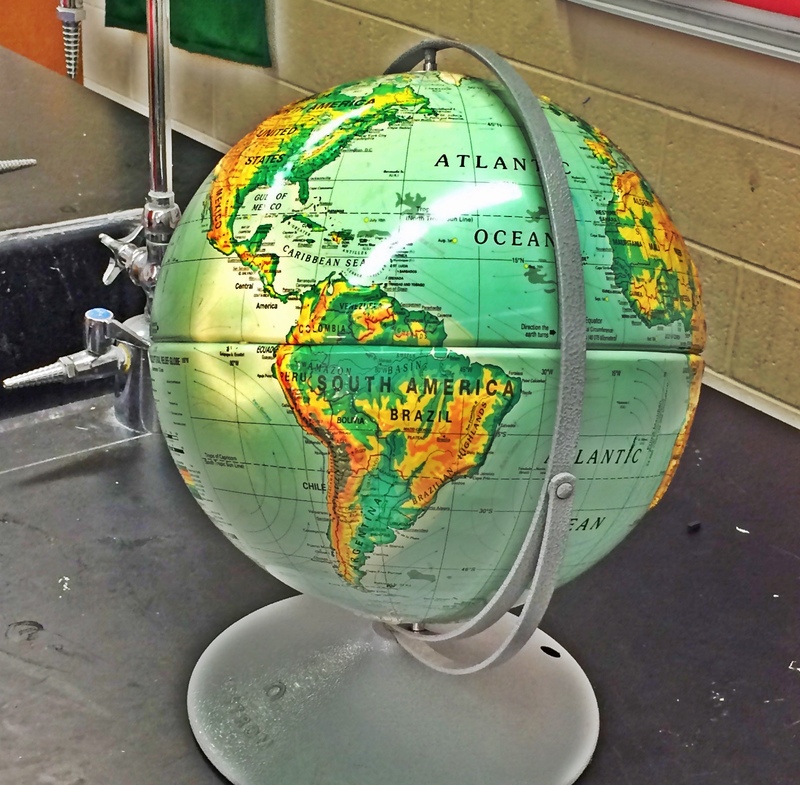 When I envisioned this, I pictured this amazing model that was a glorious representation of the earth that included different types of surfaces - surfaces that reflect light, absorb light, use light for reactions, etc. When I put it together, it ended up looking a little bit more like an elementary school student's diorama. When I introduce this to my students, I take a moment to poke a little fun at myself and we have a good laugh. I then emphasize that the purpose of the model can still be served even if the model looks "crafty". Read the bottom section of the front of your W.1 notes page that states, “Only a small percentage…” and “Color”. 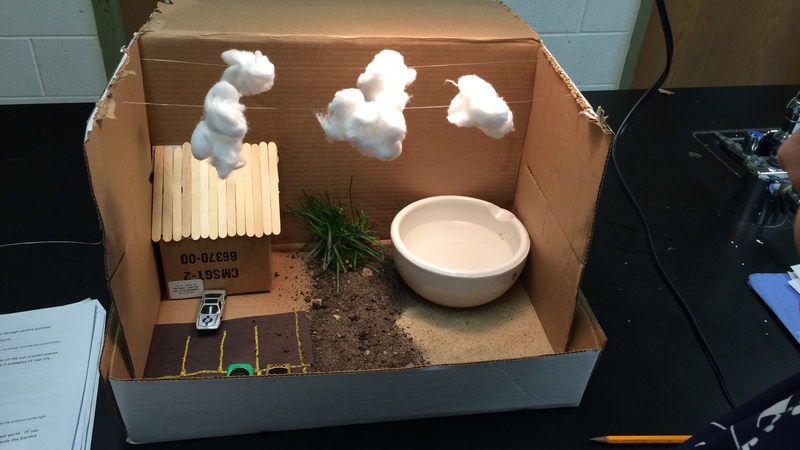 Determine a way that you could use the flashlight and box diorama to model the different paths light may take as it travels from the sun to the Earth’s surface. At this station, students should note that light can take many different paths as it travels from the sun through earth's systems. In addition, they should recognize that the different types of surfaces on earth can cause the energy to take different paths as well. Read the top of the back of your W.1 Notes page. Just read the section titled “The Uneven Heating of the Earth’s Surface”. Do not read “The Greenhouse Effect” yet. 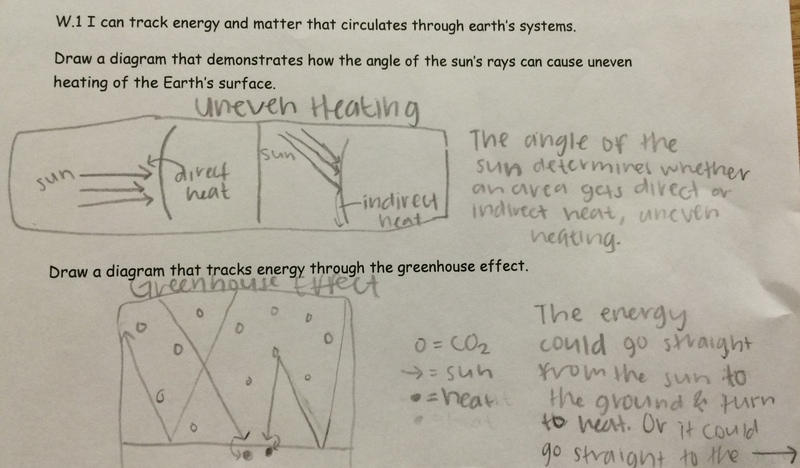 At this station, students note that the angle of the sun's rays can impact temperature. Students should recognize that the sun's rays hit more directly at the equator and indirectly at the poles. In addition, students should recognize that the tilt of the earth's axis causes the sun's rays to be more direct in the winter than in the summer. As you can see from the student work above, many students tend to focus on one of these examples. Emphasize to your students that they are looking for two examples! 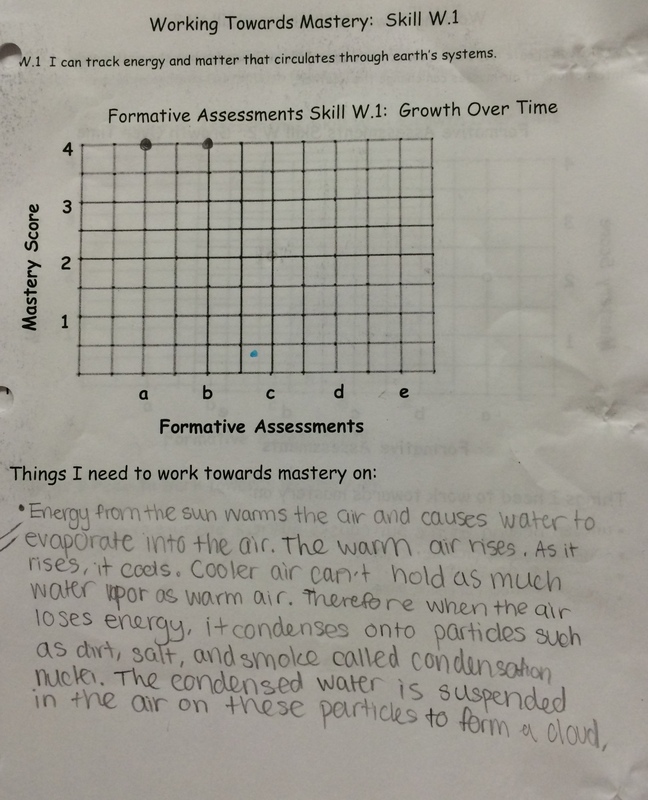 Read the bottom section of the back of your W.1 notes sheet titled “The Greenhouse Effect”. Go to High Adventure Science, from the Concord Consortium. The simulator on this website can serve as a model of the Greenhouse effect. Volcanic eruptions release CO2 into the air. The green dots represent CO2. The red dots represent heat energy. The yellow dots represent the sun’s rays. Press play on the simulator. Watch the graphs of the temperature and the CO2. Press the “erupt” button a few times and note the change in carbon dioxide and temperature both in the model and in the graphs. Press “Follow Energy Packet” to follow the path that the energy can take. Press “Stop Following”. Repeat step 5 to see a different path the energy could take. Click the “Remove CO2” button. Watch the changes in the model and the graphs. Click the “Remove CO2” button a few more times. Again, watch the changes in the model and graphs. At this station, the students have to identify different paths that energy can take as it travels from the Sun to Earth. This student identifies that the light could be reflected off the ground, absorbed by the ground, absorbed then radiated back out, or absorbed/radiated/trapped by carbon dioxide. In addition, students draw their final graphs that were created in their online models. After analyzing those graphs, the student above notes that an increase in carbon dioxide results in an increase in temperature. For each of the discussion questions, I have included a video of my students discussing. I find that as a teacher, it is helpful to have an idea of what my students are going to say so that I know which follow up/prompting questions I might need to ask as students work. The clips below can give you that insight! 1. How does the Sun create uneven heating of the Earth’s surface? 2. If you were going to track radiant energy from the sun moving towards the Earth’s surface, what are some paths that the light waves may take? 3. Analyze your graphs from the Interactive Model. How can the data you collected provide evidence of the greenhouse effect? 4. We saw the temperature rise as the volcano erupted and produced carbon dioxide. Does carbon dioxide produce heat? When there is more carbon dioxide, the temperature increases. Therefore, anytime the temperature increases, there is more carbon dioxide. Discussion questions #5 and #6 address these misconceptions. While the students in the videos recognize that this is not true, you will have students that follow this train of thought and misinterpret that the greenhouse effect is the cause of all high temperatures. 5. Susie was at the beach. The sand was so hot it was burning her feet. She said, “That must mean there is a lot of carbon dioxide in the air. The greenhouse effect is increasing the temperature.” Fact or misconception? 6. 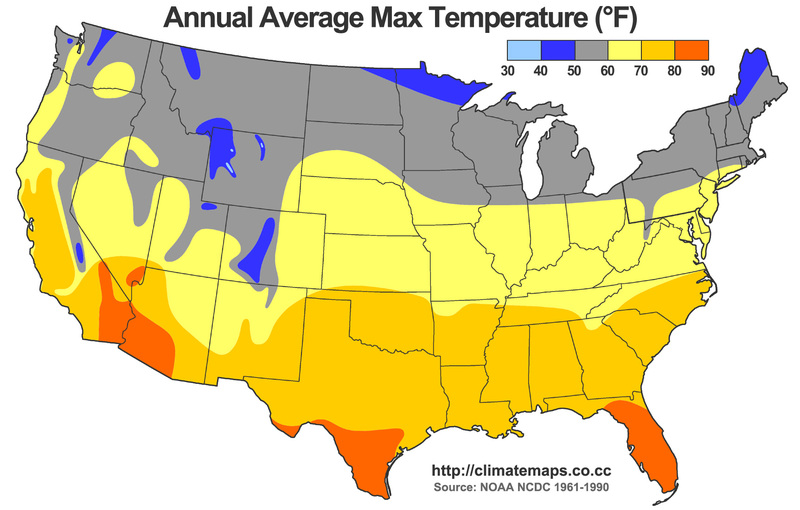 Analyze the graphs comparing the average temperatures in Florida compared to Michigan. Does this mean that the greenhouse effect is greater in Florida than in Michigan? 1. Students that do not draw arrows showing the paths the energy is taking. The question asks students to "track" the energy. Some students do not draw the paths that the energy might take and instead might simply write, "Carbon dioxide traps heat.". 2. 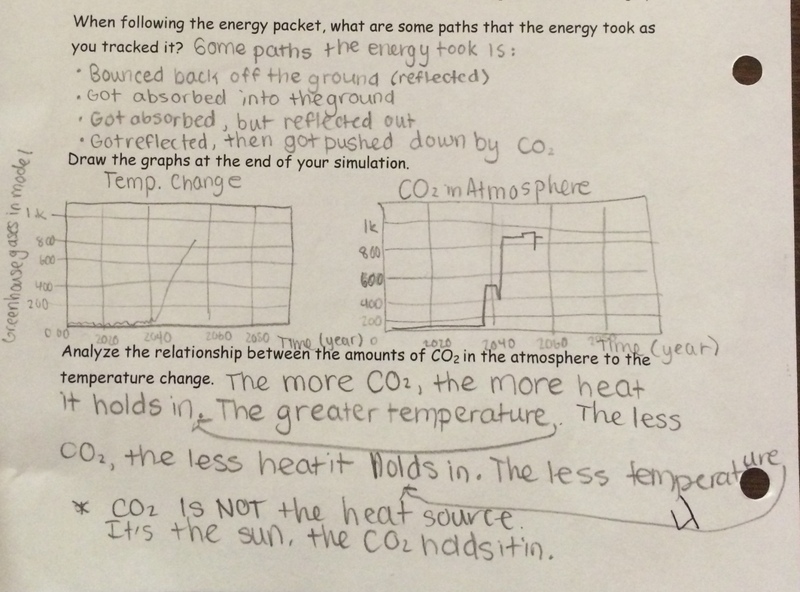 Students that do not mention greenhouse gases/carbon dioxide as gases that are specifically trapping the heat. Many students will draw the process very well due to the online model they completed. However, I always get a group of students that forgets to include carbon dioxide in their explanation. When I meet with conference groups, students plot their score on their "Working Towards Mastery" list and write the feedback that I give them at the bottom. This is a really important tool for students in their journey towards mastery Students know exactly where they stand with each skill and have a detailed account of their unique, specific feedback!